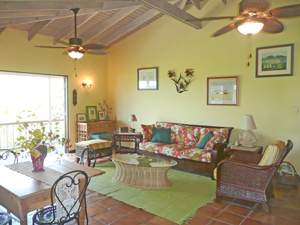 Meridian is a St. John vacation rental built in the traditional West Indian style with wrap around decks, and painted with charming tropical colors. mile and a half from Cruz Bay. 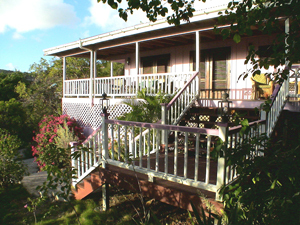 The house faces south and west,and sits above the tree line and looks across Chocolate Hole to St. Thomas as well as down along the beach at Hart Bay. 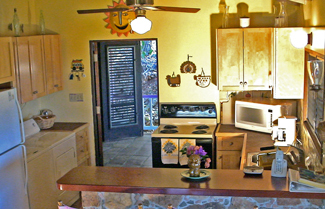 and native stonework and local art complete the island theme. with cable service, and DVD. In addition there is a stereo system with CD, telephones, answering machine, and DSL/wifi. by a counter with seating. and open onto the decks. They are fully screened and will let the breeze through even if they are closed. Or leave them open and get a little closer to the world outside. a dining table, as well as a sitting area with couches for reading, relaxing or just enjoying the view. high-ceilinged bedrooms, each with its own full bath. 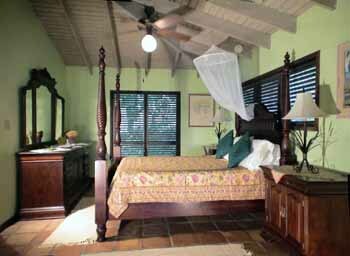 The master bedroom has a mahogany four poster queen bed, cable TV, and french doors that open onto the deck. be made up as a king bed. The adjoining bathroom has a bath tub. 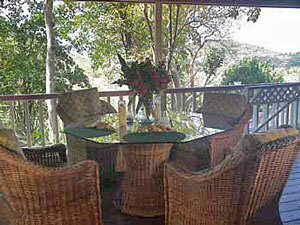 A wonderful home for a honeymoon, two couples or a small family. 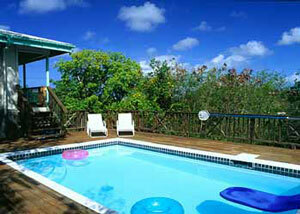 A few steps down from the main deck, brings you to the large private pool deck. Enjoy the sun or bring your lunch out and eat al fresco in the shade beside the pool or just day dream in the hammock. to either Hart Bay or the beach at Chocolate Hole. 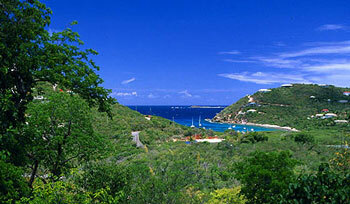 Meridian is less than a mile and a half from Cruz Bay on a paved road and a half mile from the Westin Hotel. Meridian will sleep four comfortably. No children under 6 years for safety reasons.